In response to ongoing industrial / agricultural accidents related to the ignition of combustible dusts, OSHA has issued Directive #: CPL 03-00-008, Subject: Combustible Dust National Emphasis Program. The purpose of this program is to inspect facilities that generate or handle combustible dusts and make recommendations to the inspected parties that will reduce the risk of fire hazard which could result in bodily injury, loss of life and property damage. Combustible dusts are often either organic or metal dusts that are finely ground into very small particles, fibers, fines, chips, chunks, flakes, or a small mixture of these. Types of dusts include, but are not limited to: metal dust, such as aluminum and magnesium; wood dust; plastic dust; biosolids; organic dust, such as sugar, paper, soap, and dried blood; and dusts from certain textiles. 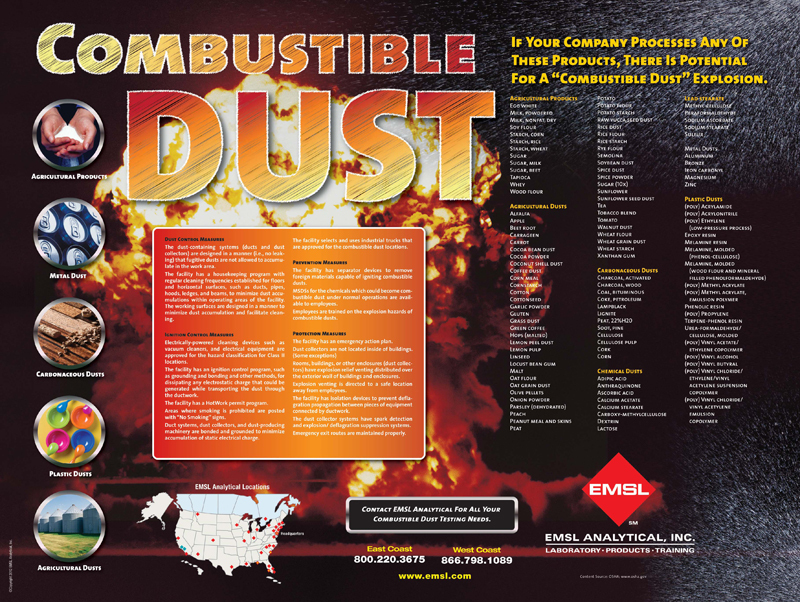 Some industries that handle combustible dusts include: agriculture, chemicals, textiles, forest and furniture products, wastewater treatment, metal processing, paper products, pharmaceuticals, and recycling operations (metal, paper, and plastic). Therefore, the directive covers a wide range of materials used in many application areas across almost all the major industrial and agricultural sectors. This is an economical and practical way to determine if the dust in the sample has the potential to be explosive. 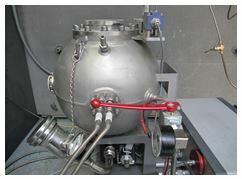 Testing consists of exposing the fine dust in the sample to low energy igniters inside the 20-Liter Siwek explosion chamber and determine the explosion over pressure. If the dust is not found to be an explosive threat, the analysis can be aborted to avoid unnecessary fees. If the sample turns out to be explosive on the screen testing, the more comprehensive analyses listed below should be conducted. This testing provides an indication of the severity of the dust explosion by determining the deflagration parameters. The larger the value of Kst, the more severe the explosion is. 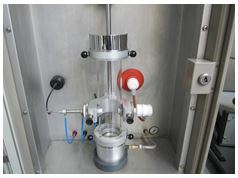 For this test, the dust is suspended and ignited in the Siwek chamber and the maximum pressureand the rate of pressure rise are measured. MEC is the minimum concentration for explosivity of a combustible dust cloud. It is determined by suspending the dust in the Siwek Chamber. MIE is the electrical energy discharged from a capacitor, just sufficient to produce the ignition of the most ignitable mixture of air and dust. It is determined by suspending the dust in a Hartmann Lucite explosion chamber. 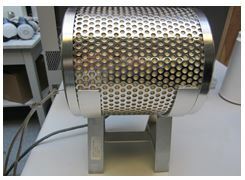 This test method covers the minimum temperature at which a dust cloud will autoignite when exposed to air and heated in a furnace at atmospheric pressure. It is determined by introducing the dust into a BAM oven. As an alternative, the minimum temperature of self-ignition of dust layer can be measured using a hot plate set-up. 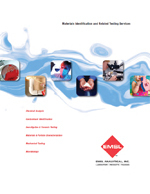 This level of testing involves a number of parameters that determine if the sampled dust is considered a Class II hazardous material. 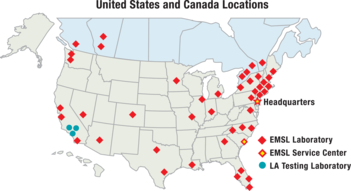 Class II locations are defined as locations with combustible dust having Ignition Sensitivity (I.S.) greater than or equal to 0.2 or Explosion Severity (E.S.) greater than or equal to 0.5. I.S. is calculated from MIT, MIE, and MEC for the sample normalized to Pittsburg coal dust, whereas E.S. is calculated from Pmax and[dP/dt]max for the sample, also normalized to Pittsburg coal dust. The resistivity testing is particularly important for metal dust. The electrical nature of the dust is one criteria to determine if it is necessary to take special precaution with regard to electrical insulation of the equipment operating in a location with Class II dust.